Summer may be slowly creeping towards fall, but I’m embracing all the fresh flavors and vegetables I can still get! Just in time for Labor Day parties, I have your perfect go-to dish. With gorgeous and crisp colors like this, how can you go wrong? 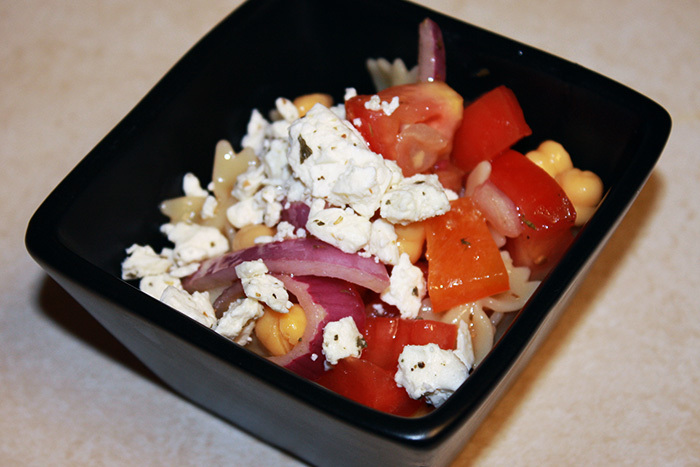 This pasta salad is super simple but incredibly tasty. The zingy, slightly sweet dressing is the perfect accompaniment to the veggies, beans and pasta. Even for someone like me who doesn’t always love vegetables, it’s a sneaky way to get something healthy on my plate. 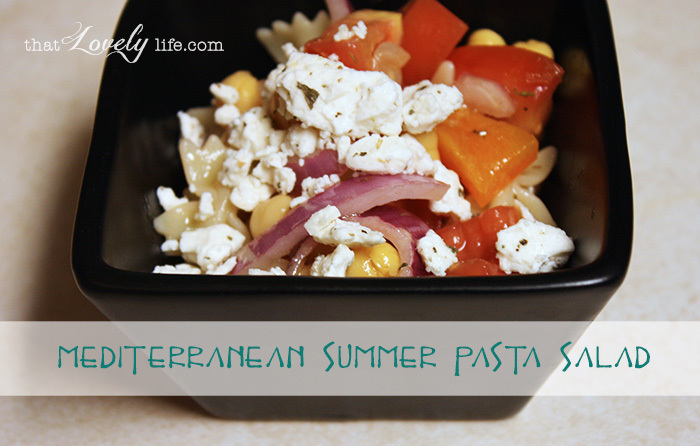 With lots of fiber, vitamins and minerals, plus protein and carbs, this Easy Mediterranean Summer Pasta Salad is sneaky-healthy indeed. At just over 200 calories per cup, you can eat this as a snack, or even a mini-meal itself. Or, pair it with lean meat like grilled chicken or turkey burgers for a delicious, rounded out, diet-friendly meal. Bring water to boil to cook your mini farfalle pasta. While pasta is cooking, start to chop—chop—chop! 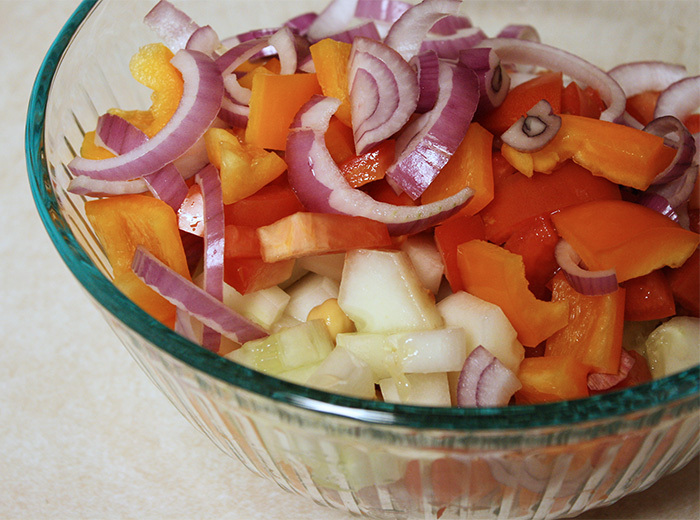 Slice up your red onion, tomatoes, cucumber and orange bell pepper into bite-sized pieces. You don’t want to cut the veggies too small, or your leftover salad could get soggy. 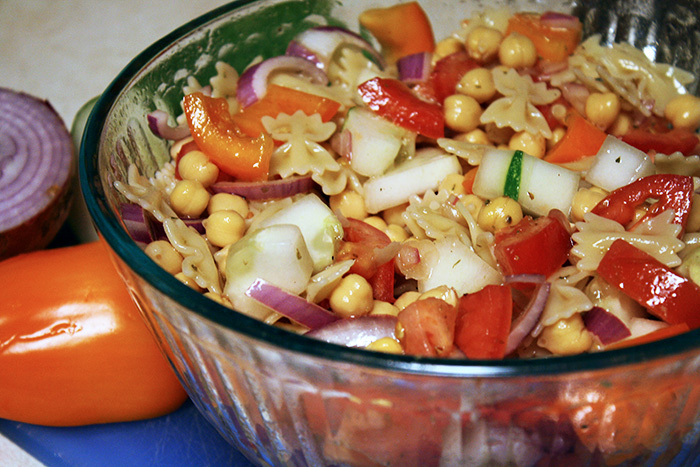 Drain and rinse the garbanzo beans, then combine with veggies. 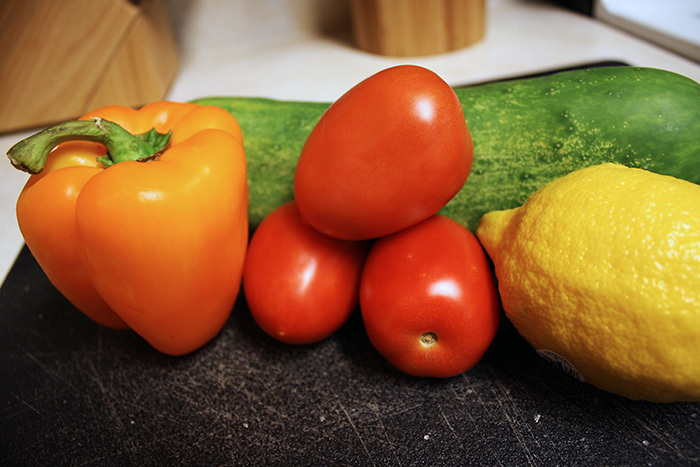 Make your salad dressing: Combine all ingredients in a shaker (I use an old-fashioned mason jar) and mix well. Once pasta is done cooking, drain and rinse with cold water until it’s cool. Combine with veggies, pour dressing over top, and mix to combine everything. You can eat this right away, but the longer you let the pasta salad sit, the better the flavors meld together. Top with a sprinkling of feta cheese, if desired. Get ready for a fiesta in your mouth. 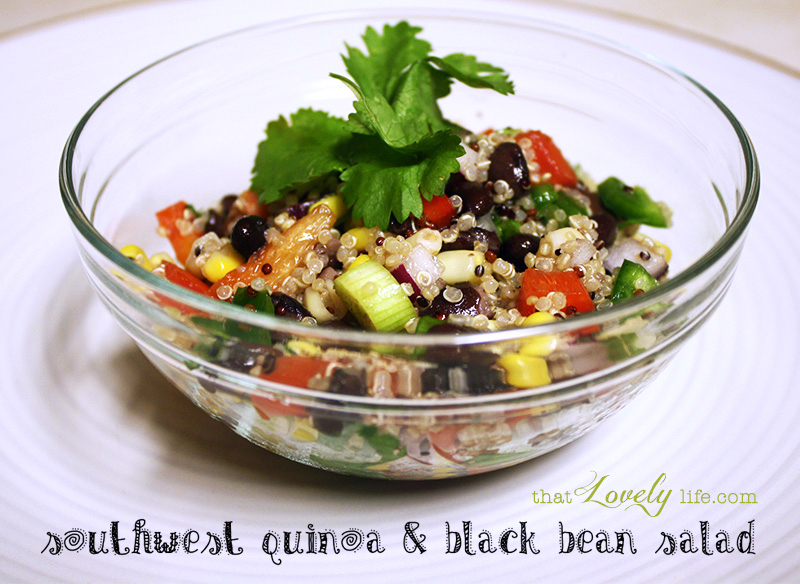 This Southwest Quinoa & Black Bean Salad has so many different flavors that come together perfectly: Hearty beans and quinoa, sweet corn and crunchy red pepper, tart lime juice, a little zing of jalapeño. It’s a wake-up punch to your taste buds. Healthy and satisfying, it’s perfect to make ahead and pack away for lunches on the go, or scoop onto a bed of lettuce for a tasty salad. You can safely take it along for a summer potluck, or simply serve it alongside some grilled chicken for a yummy, balanced dinner. 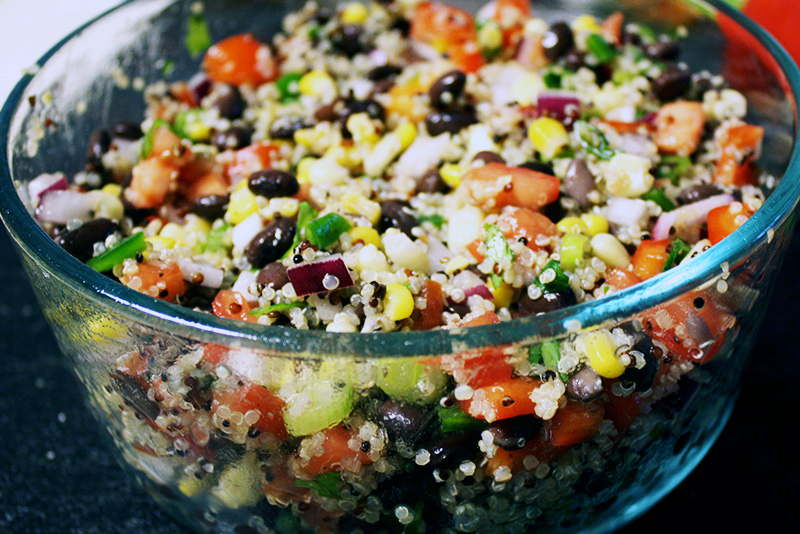 One cup of this salad yields about 175 calories. It’s filled with protein and fiber, so it’s sure to help keep you full and satisfied…great for summer dieting, or just a healthy staple to add to your weekly dishes! 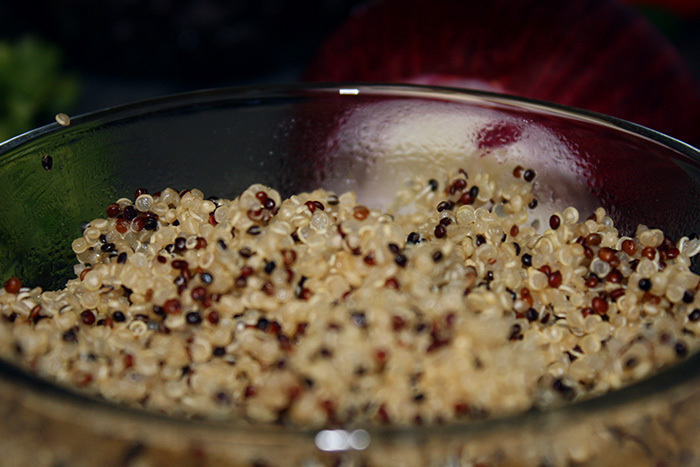 Cook quinoa and set aside to cool down. Chop up red pepper, red onion, green onion, tomato, jalapeño and cilantro. Combine all ingredients except limes, salt & pepper. Makes about 5 cups total. As I’ve started to rack up the miles for my marathon, I’ve been hoping that the pounds I’ve packed on over the last several months will come melting off. And while lately I’ve felt like and/or look like I’m melting while running in the summer heat & humidity, it’s really come down to some easy, healthy, quick meals that are helping me lose a few pounds. 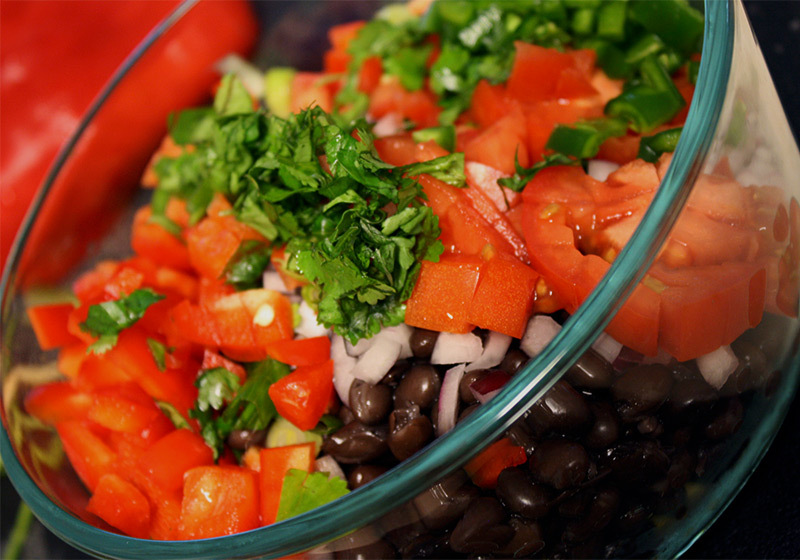 Here’s a simple taco salad that I like to make on Monday nights. The leftovers are enough to last me for a couple lunches or dinners throughout the week. …Depending how many tacos my fiancé decides he’s going to scarf down, that is. This salad is great to pack up and take with me to work, or equally easy to throw together at night after I work out and starvation begins to settle in. While this meal is nothing new or creative, it’s really all the healthy substitutions here that make over tacos into a hefty but healthy taco salad…filling you up for only 300 calories. Boom! Cook turkey meat like you would ground beef. There is barely any fat in the 99% lean turkey, so I don’t even bother to drain it. Hi, easy. Add seasoning & water, let thicken. Don’t let the white meat creep ya out. Inhale sweet aroma of almost-dinner. Make your beans & rice. That’s pretty easy too, if you can read the back of a box. I use romaine lettuce instead of the usual boring iceberg lettuce; romaine has more nutrients & a good crunch to it. Plus, you can chop up extra and store in an unsealed plastic bag, and it doesn’t get soggy like iceberg lettuce. These toppings are kinda the keys to this taco salad. Get a GOOD salsa; it will add SO much flavor. 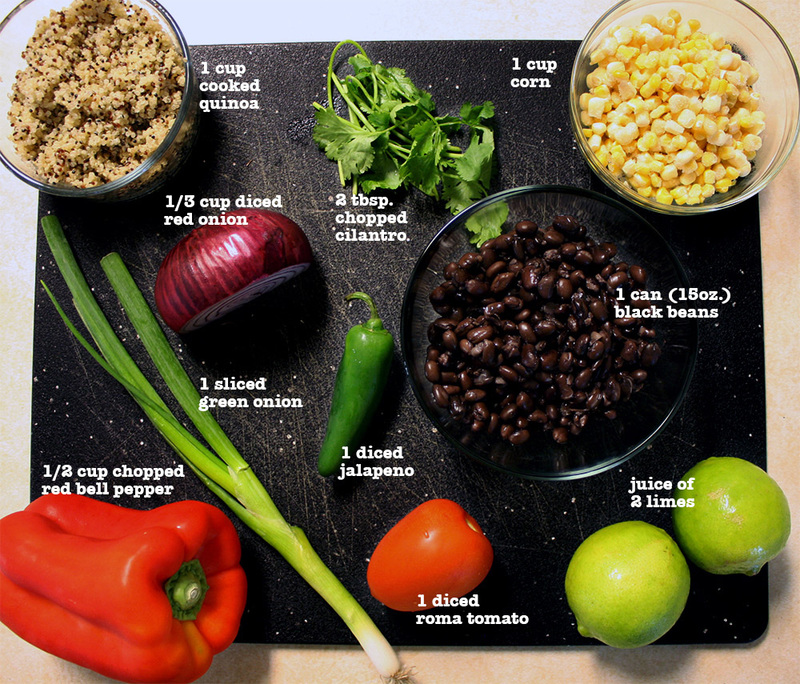 I like corn + bean salsas, because they have a little more substance, unique flavors, and add some extra fiber to keep you full. And if you haven’t tried plain greek yogurt in place of sour cream yet, you MUST. I will admit, it is not a 100% identical substitute when you use it on top of a potato or something bland. But when you put it on a taco salad, which already has 398745 other flavors going on (or a good chili), I promise you won’t notice the difference. You get no fat, more protein, and it’s creamier & richer than sour cream. Just trust me. Make your bed of lettuce & veggies. Top with ½ cup turkey meat + ½ cup rice & beans. Top with salsa, plain greek yogurt (or light sour cream if I haven’t talked you into the yogurt thing), and hot sauce. Stab fork, lift, chomp. Yum. Repeat for an easy lunch or dinner, this should last you a couple days! What are your easy, go-to meals? 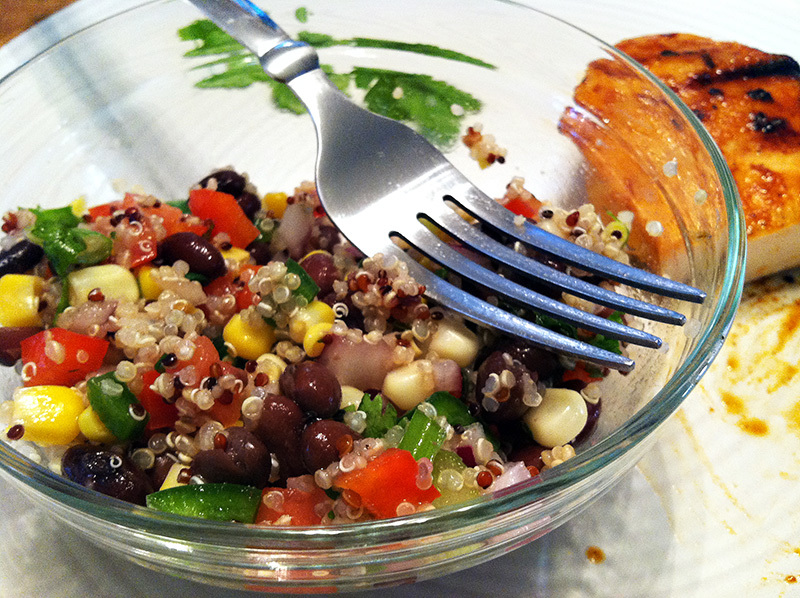 Do you have any healthy substitutions to ‘make over’ some less healthy meals?